Melina has been preparing for a future career as a spy. She just doesn’t know it. 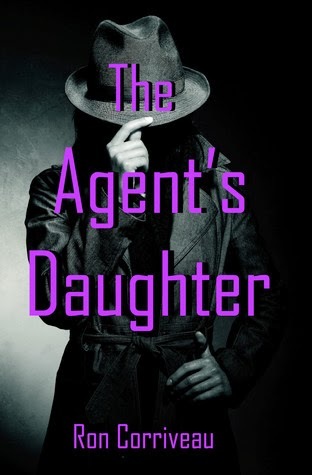 Legendary spy Evan Roberts always knew that his fifteen-year-old daughter Melina also possessed the absolute lack of fear required of an agent. Without telling her his real profession or his intention, he began to guide her toward an eventual career as a spy. However, Melina’s world is shattered after her mom is involved in an accident that leaves her mysteriously unhurt but unresponsive. Her father’s plans on hold, Melina settles into life at a suburban high school, immersing herself in a world of schoolwork, her friends and a budding romance with Alex, the cute new guy in her class. When Melina and her father uncover shocking new information about her mother’s accident, Melina is pulled deep into her father’s shadowy world. With Alex desperately trying to find her and only hours to go before it will be too late to save her mother, Melina and her father work together using their combined skills to find a way to reach her. I read the last of the Hunger Games books, Mocking Jay. My daughter, Melina, made everyone in the family read the series, and I was the last holdout. As I am writing this, we just got back from seeing Catching Fire at the theater. This touched off a Peeta vs. Gale discussion with my daughter when we got home. We are on opposite teams. Christmas-eve was last night, so the whole family got into our Christmas pajamas and watched Elf before we went to bed. First TV character to come to mind? Mordecai and Rigby (sorry, two characters.) The two main characters from the Cartoon Network cartoon, Regular Show. My son, Travis, watches this show all day. It is the weirdest cartoon I have ever seen, and I can’t help but watch it with him. Song that’s stuck in your head? As soon as I read “stuck in your head,” my mind went right for the mother of all songs that get stuck in your head: It’s a Small World, from the ride at Disneyland. I grew up in Southern California, so we went to Disneyland a lot. Every day, I Google “Texas Rangers” and the words “trade” and “rumors” with the time frame set to Past 24 Hours, so I can keep up to date on off-season transactions for my favorite baseball team. I played baseball for years, and I truly love the game. I spent some time working in Egypt, so I got to travel all over that country. The city of Abu Simbel, which is just north of the Sudanese border, is the furthest that I got. Tortilla chips. Especially the ones at a Mexican restaurant. Coffee. I consider it a necessity. I am not currently reading a book, but my daughter has made everyone in the family read the Divergent series. It seems that I am next. I have until the movie comes out. 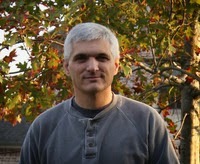 Ron Corriveau is an electrical engineer and works designing custom integrated circuits. He started writing to prove to himself that he actually does have a right side to his brain. Originally from Southern California, he currently lives outside of Dallas with his lovely wife and two awesome kids. He has only recently come to terms with the fact that he is a geek, although he would like to stress that he doesn’t hold any kind of leadership role in the organization. Hah I also made my whole family and a bunch of friends read THG a while back and they ALL loved it! Woot! Great interview, guys!